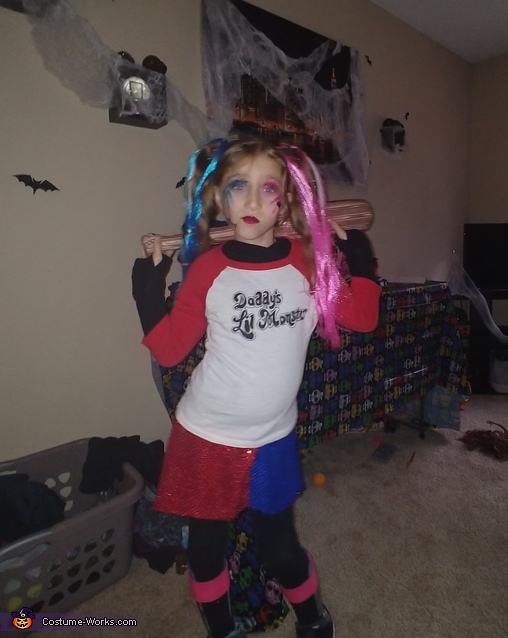 My daughter wanted to be Harley Quinn this year but didnt like the ready made costumes so we got to sewing and made one for her. Her shirt was 100% hand drawn, sequin skirt sewn by hand and even the bat was crafted from a thrift store foam bat, woodgrain duct tape and some letter stickers and a sharpie. She was the hit of the neighborhood and had an abslute blast showing off her "bad guy fighting skills".